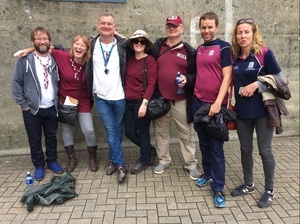 Galway fans celebrating their side’s All-Ireland final victory under the Cusack Stand at Croke Park on Sunday (left to right): Conall McGarrigle, Mura Tierney, Micheal O Tiarnaigh, Karen Reen, Ciaran Tierney (author), Reamonn Canavan, and Orna Canavan. I was a young student, squatting in London, the last time Galway won the Liam McCarthy Cup and I consoled myself that there would be plenty more September victories when I declined my father’s offer of a ticket and a fare home. Our team was the best in Ireland and I figured there were plenty more glory days ahead, so I delayed my return home for a winter of studies at NUI Galway. I thought of the old man, aged over 90 now, presumably shedding a few tears at home in Galway City. He brought me to Croke Park when I could barely walk and, as an adult, I used to curse him for this strange, seemingly fatal, and beautiful addiction which can arise such passion on summery Sunday afternoons. He had followed the team long before I was born, with the same sort of fatal pessimism which was common to our Tribe until about 5pm on Sunday. I remembered 1980. My brother and I were small boys, held aloft by crying adults amid the din of seeing our side become triumphant for the first time in 57 years. Those tears made a lot more sense now, after so many years of heartbreak of our own. My brother and I had been to every final Galway had lost since a youthful Conor Hayes bounded up the stairs to collect the Liam McCarthy back in 1988. Galway didn’t score a goal, again, but it didn’t matter when we had such supreme marksmen scattered around the field. They tested our nerves by letting in two goals, but was it ever going to be any other way. In my previous life as a sports reporter, I had been to many All-Ireland finals. But this was different. I had watched Kilkenny and Cork teams pick up the Cup with the casual appearance of people who were out for an afternoon shopping trip. …I thought of friends in London, Sydney, New York, Vietnam, and Brazil, and how joyful they must have been at that very moment, crammed into Irish bars in their maroon jerseys at all sorts of hours. Few things can unite our global diaspora like an All-Ireland final. I thought of men like Ollie Canning, Joe Rabbitte, Eugene Cloonan, Kevin Broderick, and Damien Hayes, so many brilliant Galway hurlers who had put their hearts and souls into winning that elusive Celtic Cross. And, as I looked out towards the Hill and the emotional outpouring all around me on the Cusack Stand, there was no shame in our tears. And nobody wanted to leave. Why would they, when we had been waiting for 29 long years? Those of us who remembered the glory days of 1987 and 1988 were reminded of our mortality, while the youngsters singing on the Hill must have felt they’d never see those kind of days. It wasn’t just a victory, it was something wondrous achieved with such class both on and off the field. To have a captain like David Burke, a man who battled back from injury and knew the pain of losing finals, step forward to collect the cup on behalf of the maroon hordes. What a magnificent speech he produced, to remember the late Tony Keady, Man of the Match in 1988 and a man who had roared on among us just a few short weeks ago during the semi-final win over Tipperary. He hoped that the win would give Tony’s wife and children just a little comfort in the midst of their grief, just as the fans had risen en masse to salute their former centre-back six minutes into the game. What a wondrous gesture to remember the late Niall Donoghue, whose tragic passing in 2013 devastated an entire rural community. In the absolute joy of what once seemed an impossible victory, he reminded us all of the need to look after our mental health. What a wonderful platform he used to raise this issue in front of hundreds of thousands of TV viewers. Even at the happiest moment of his life, he gave a shout out to those who struggle with demons and the organisations, like Pieta House, who provide wonderful help in the darkest of times. There’s a lot wrong with Galway GAA – I know too many loyal fans who failed to get tickets for the final – but our young sportsmen did us so proud on Sunday afternoon. Down on the pitch, our 28-year old ‘superstar’ showed the kind of humility he never gets enough credit for as he embraced Margaret during his captain’s speech. Without Joe Canning, Galway would never have reached this final and now the nay-sayers can no longer slag off the most gifted player of his generation for not having that elusive All-Ireland medal. Did he bask in the glory? Of course he did. But he took time out to hug the newly bereaved widow, shared a tear with his parents at the front of the stand, and embraced children with special needs long before he made his way back to the dressing-room. Such class from a young man who has faced far too much derision and begrudgery since his phenomenal talent began to generate headlines a decade ago. The Galway hurling community is very much like a big family and the family rallied around the Keady family with absolute class throughout the weekend. It would have been the perfect weekend if the GAA could sort out the ticketing arrangements which somehow leave some genuine supporters out in the cold. The single mum from East Galway who takes her son to every game or the club hurler in the city who only missed the final deserve better than the people who attended their first and only game of the year on Sunday. It was embarrassing to note that Galway fans were outnumbered about 4-1 by their Wexford counterparts at the Leinster final in early July. Too many Irish sports fans tend to jump on bandwagons and it seems hugely unfair that so many tickets for the showpiece occasion of the year don’t go to the people who actually go out and support the teams in the earlier rounds. Having said that, the Galway team of 2017 conducted themselves with absolute class, both on and off the pitch, throughout the weekend. What a moment of pure emotion it was to see their wonderful manager Micheal Donoghue embrace his father, Miko, after bringing the Liam McCarthy Cup across the Shannon for the first time in 29 years. Micheal surrounded himself with a wonderful backroom team and instilled the kind of self-belief in his players which has been lacking in Galway teams for much of the past three decades. It was a wonderful championship. My favourite memory of all was of the three Tipperary supporters who embraced us and wished us well for the final in the Upper Hogan Stand at the end of a thrilling semi-final in August. So magnanimous in defeat, such worthy All-Ireland champions, I thought to myself as I remembered that I used to “hate these guys” when Tony Keady was at his pomp back in the 1980s. Hatreds can disappear with time, old enemies can embrace and share their love of a brilliant game, and sometimes even the bridesmaids can become champions. Thank you, Galway hurlers, for filling an entire county with wonder, joy, and pride. And for showing us that some tales of woe and heartbreak really can have wondrous endings when you mix in belief, hard work, and skill. Is RTE Lol-ing At Its Own Since opening our doors in 2003, has delivered thousands of web and digital experiences, across a multitude of website design companies new delhi platforms alarge enough to offer you the knowledge and expertise we’ve gained servicing the Corporate and website design in Japan Government sectors, yet small enough to care. . The West has awoken from its slumber and the new dawn is a joy to behold. 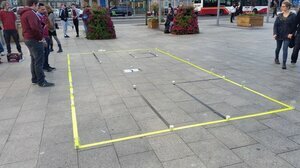 Life In The Yellow Box Existential Salthill Dog Meanwhile, In Salthill, Galway Sure Where Would You Get It? Posted in Misc and tagged Ciaran Tierney, Galway, Is The GAA The Illuminati? at 1:46 pm on September 8, 2017 by Ciaran Tierney. could have sworn Clare is on the western side of the Shannon! sports team wins competition shock! Missed half the match… King Kong Company were busy bangin’ out the choons boi ! Caught the second half tho, and as a Galway lad livin’ in Waterford now… it was some craic hai ! Gailliamh Abú …Waterford…. well… Blaas for everyone ! Or, in short, Galway won the 2017 All-Ireland beating Waterford 0-26 to 2-17. BTW, I’d no more worry about Joe Rabbitte and Eugene Cloonan feeling hard done by than I would feel we’re been to hard on Brian Cowen and Bertie Ahern. I was carried over the stiles to Croker since I was a kid on All-Ireland Day, Football, and Hurling by my dad. (He had a ticket – I stooped on the steps for three hours, avoiding officials). I remember the smell of pee and ham sandwiches at the Hogan Stand. Great days.